Recommended for perimeter use. 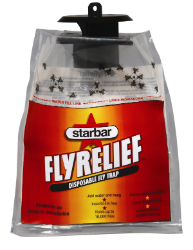 Insecticide-free disposable fly traps with built-in attractant. Fly Relief catches thousands of flies. Easy and convenient to use. Excellent for use around pets, in the yard, kennel, and in garbage containers.